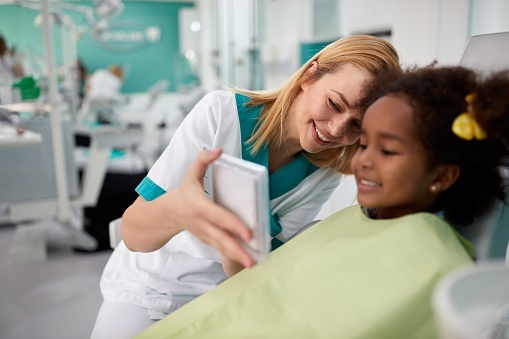 Considering becoming a dental assistant? You’re not alone. The industry is continuously growing, with an estimated 65,000 more dental assistants needed by 2026. Dental assistants play a significant role as a member of the dental health care team, increasing the efficiency of the dentist in a number of ways. They provide patient care, take x-rays, assist with dental procedures, and handle other routine tasks. PCC’s Integrated Community Dental Assisting Program can help individuals begin their career in dental assisting. Our program runs from summer term through winter and helps students gain the foundation they need in only three terms, with integrated field experience at an affordable cost. Before applying to the Integrated Community Dental Assisting Program, it’s important to understand the time commitment. The program takes nine months, or three terms, to complete. All didactic work is done online, and labs are held every Saturday. Students will also participate in an externship in a dental office once a week during the first term and two days per week during the second and third terms. The cost of the program is another important factor. Tuition is $7,829, excluding books, exam fees, and the student kit. Full tuition is due at the time of registration, or students may set up a 3-month payment plan with the PCC Business Office. The program is limited to only 24 students, and applications are accepted through March 1st for the summer term. When applying, there are a few things you are required to have in order to complete the application process. Students must download an application packet and get it to us before its deadline to expedite the process. To qualify for the program, you must submit a cover letter explaining your interest, and your skills and strengths as they apply to the ICDA program. In addition, please provide your understanding of how the program works, including the program requirements and expectations. You also need a high school diploma or GED, a math score of 20 or an equivalent placement score, and a writing score of 115 or higher, or placement into Writing 121. Students who apply for the program must have 8 hours of job shadowing experience in a dental office or clinic. They will also need a copy of their current healthcare provider CPR certification. The CPR class must include Adult, Child, Infant CPR and Use of Defibrillator. Before beginning the program, you must also have certain tests and vaccinations. You’ll need to provide evidence that you’ve completed the Hepatitis B Vaccination Series (or a signed declination form), as well as a Measles Mumps Rubella (MMR) and Chickenpox vaccination (or history of past disease). We also require that you have a current tetanus vaccine and a current tuberculin skin test. For a full-list of vaccines make sure you follow the checklist on the application packet. Apply for the Oregon EFDA certificate (administered by DANB). Our Integrated Community Dental Assisting Program is designed to prepare you with the skills, experience and certifications to have a great career as a dental assistant once you graduate. Students will learn how to interact with patients, perform dental x-rays, take molds, manage records, and more. Sign up to receive updates about the program or download the application packet to take the first step to your new career as a dental assistant.